What happened to the Brazilian NGOs? Brazil´s international humanitarian engagement grew exponentially in the beginning of the 2000´s. The NGOs seemed to be a part of it, with Viva Rio in Haiti as the prime example. As part of the research project Brazil´s Rise to the Global Stage, hosted by Oslo Peace Research Institute (PRIO), I have explored the NGO channel. This Policy Brief gives you the results in four pages. 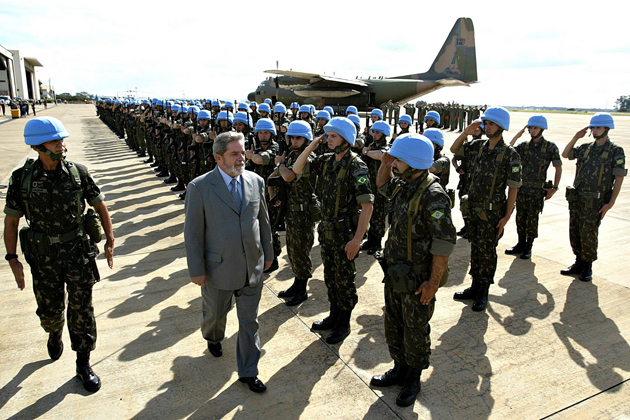 Former president Lula da Silva and Brazilian troops heading for Haiti. Brazil led the UN stabilization mission on Haiti (Minustah) for a decade. Read the full PRIO Policy Brief here. ​Over the last fifteen years, Brazil has experienced a sharp rise and distinct fall in its international humanitarian engagement. The role of Brazilian non-governmental organizations (NGOs) in this picture has been presented in conflicting ways. The Brazilian government has repeatedly underlined the importance and growing presence of NGOs in Brazilian international cooperation. At the same time, NGO representatives have called attention to the lack of government funding for their international activities. Most Brazilian NGO efforts internationally have been funded by UN agencies and countries like Norway and Canada. This policy brief studies Brazilian humanitarian engagement and Brazilian development NGOs working internationally, with a special emphasis on Haiti, and promotes a set of policy recommendations to Brazilian and Norwegian authorities.